Mine may well have been one of the fastest trips to the South Pole. Amundsen, who led the first party to reach the South Pole ever in 1911, took 15 months and 9 days from Norway via ship and dog sled. Byrd got to the South Pole by ship and by plane in 15 months and 3 days (he had a particularly slow ship hauling his plane and, like most, dealt with weather delays). Just as these explorers piggy-backed on the transportation technologies of their day, I did, too. My trip from the US to the South Pole made use of the most modern of aircraft and took me 69 hours – not quite three days. Three days is an impressively short time to get to the pole. Most trips involve some sort of delay, if not many delays as they compound upon each other. The first leg – a flight from Los Angeles to Christchurch, New Zealand – is pretty straight forward. What Antarctic travelers truly dread is when their flight on the military C-17 Globemaster III aircraft from Christchurch to McMurdo Station on the Antarctic coast “boomerangs.” They get part way, if not all the way (5 hours), to McMurdo only to find the conditions are too poor to land, “boomeranging” them back to Christchurch to await better weather. The group I flew down with was the fourth major batch of people headed for the pole this season. We arrived in Christchurch around 10am after a 15-hour flight from Los Angeles via Auckland. Still in a daze from the long, cramped coach class flight, we went straight to the Antarctic Deployment Center to pick up our Extreme Cold Weather (ECW) gear. This process involved sitting through a briefing, finding two large orange bags with our name on them full of protective clothing, trying it all on, swapping out what didn’t fit, trying that on and repacking the orange bags. One of our orange bags we fill with the ECW we need for the flight. It’s not because they can’t warm the aircraft’s cabin, but because Antarctica doesn’t have jetways. When we get off the plane, we will step right out into the elements. The other bag has any duplicate items of ECW (long underwear, etc.) and the rest of our checked luggage that we won’t have access to during the flight. Ergo, we also have to pack a day’s worth of street clothes and toiletries as part of our carry on in case we are separated from our checked baggage. 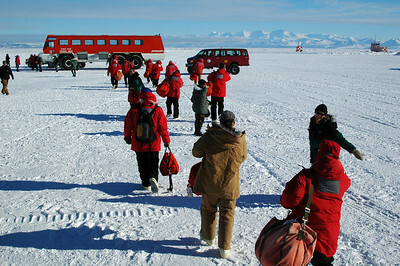 Not a week before us, another arriving group went through one of the worst sequences of transport events. From Christchurch, their first flight was canceled and their second flight boomeranged. It took them three days to get from Christchurch to McMurdo. Then, once in McMurdo their first flight boomeranged as they were over the pole, their second flight was canceled and their third flight boomeranged, once again right over the pole – another three days to get to the pole from the Antarctic coast. Suddenly, I was counting my blessings to have spent as little time as we did getting here. But our flight to the pole was not without some suspense. 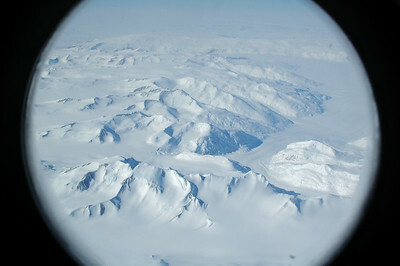 At first, we were delayed an hour departing McMurdo. After a very smooth flight with amazing views of the Trans-Antarctic Mountains and of the polar plateau’s vast expanse of white nothingness, the temperature at the pole dropped below the operational range of the aircraft, -50 degrees Centigrade. It was now -50.6°C. When the temperature drops below -50°C, a few factors make it difficult to operate aircraft. First the hydraulic fluid controlling nearly every moving part on these LC-130 ski-equipped aircraft turns to jelly and freezes up. This means the pilot can’t steer, control the engines or manage other aspects of the aircraft. Another problem is once the plane is on the ground the skis freeze to the snow. When the aircraft lands the impact and friction is enough to melt some of the snow right under the skis. But as the aircraft slows down and comes to a stop that water starts to freeze again welding the aircraft to the skiway (a runway made of snow). There are some tricks for keeping the skis from freezing to the ground, but they aren’t always successful. We started circling around the South Pole Station in a holding pattern in the hopes the temperature would rise enough to allow us to land. After an hour and a half, the weather station reported a change — -50.3°C. Rounded to the nearest whole degree, we went in for our landing. One of the aforementioned tricks for preventing the skis from freezing to the ground is to dump the cargo from the aircraft out the rear cargo door right onto the snow taxiway while the aircraft is still moving. The rear cargo doors opened while we sat in the very front of the cargo bay and on the command of the flight crew the pallets of cargo slid smoothly out the back and onto the snow. We looked aft and saw the cargo pallets disappear in the flurry of snow kicked up behind us in the propwash. When the aircraft finally came to a stop, we were hurried off the plane, the outgoing passengers were loaded up, and in a blink the plane was airborne and on its way back to McMurdo. 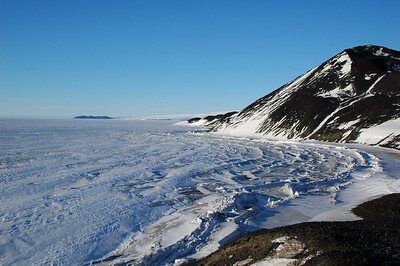 In McMurdo, the 3794 meter snow-covered Mount Erebus dominates the view. Stepping off the plane from Christchurch, the sight stops you in your tracks. But there’s little time for awe and wonder as the ground transportation crew hurries you off the skiway and onto Ivan the Terrabus, the massive shuttle with six 4-foot tires that transports everyone to the station. When I stepped off the plane in McMurdo, the glorious sunbeams were warm and suddenly -20°C didn’t feel so cold. On Ivan, we grinded along the flagged roadways and pulled up to the “Chalet” for another briefing, room assignments, and our schedule for our flight to the pole the next morning. After finding my room, making my bed and getting out of the superfluous ECW, it was time to eat and explore. I went to explore Hut Point, where the British explorer Robert Scott built a hut to base some of the British Antarctic adventures in the early 1900s. Sleep came easy that night as I bedded down around 10.30pm even though the sun was still up. Solid shutters kept the room dark and when I woke at 5.30am the next morning, the sun was still up, but had rotated around to a different part of the sky. After breakfast we were back on Ivan and rolling down to the skiway to fly to the pole. 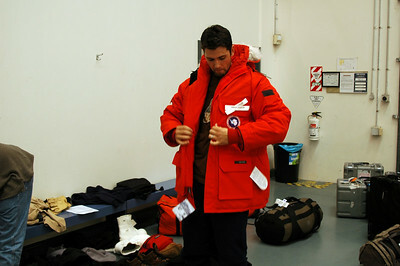 The -50.3°C air was the coldest I have ever felt as I deplaned at the South Pole. 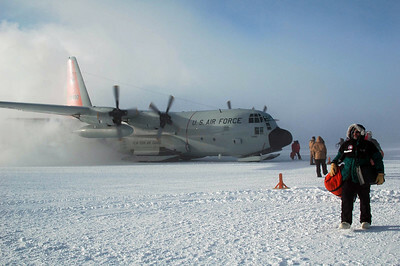 The engines of the LC-130 were still roaring and the sun was partly obscured by the snow kicked up in the propwash as we marched off the skiway with our orange bags slung on our shoulders. For many of us, it was our first time to the pole and I already had my camera out and snapped away without stopping to keep the flow going. We went straight to the new South Pole Station building — which is still under construction — to get our housing assignments. I’m living in a section of the base called Summer Camp about a five-minute walk from the main building. The structure I live in is called a Jamesway and it’s a long semi-cylinder canvas building with a domed roof that extends down as the walls. A central hallway gives access to the 14 “rooms” separated by thick curtains or thin panels of plywood. I plopped my bag down on my bare mattress where a pile of clean sheets and blankets had been left for me. This 2×3 meter space with the domed roof will be my home for the next four months. Thanks! Check out the rest of my experience there by clicking on the next story below "Working at the South Pole". awesome account of your Antarctic adventure Cam!